Frank McGlynn had to think long and hard before agreeing to give Declan Bonner a commitment. The end was nigh in the mind of the 2012 All-Star and Bonner had some convincing to do. The pair met and discussed Bonner's plans after his appointment to succeed Rory Gallagher as the Donegal manager for 2018, but McGlynn seemed to have made up his mind. He had been replaced at half-time in Donegal's Ulster semi-final loss to Tyrone, but worse was to follow a few weeks later in Sligo. Deep in added time at the end of the first half of Donegal's heavy qualifier loss to Galway in Sligo, the board went up and McGlynn was called ashore. An inglorious, unfortunate end looked to have befallen him. Those memories were fresh when he sat with Bonner as the Donegal manager outlined his plans. Finally, McGlynn decided that he'd go to the well again. McGlynn and Donegal will come face-to-face with Gallagher, now in charge of Fermanagh, in the Ulster final in 12 days' time, when McGlynn will make his 60th championship appearance, his 162nd in all, for Donegal. "You're happy with any Ulster semi-final you win, and we're happy to get back to the final after last year's disappointment," McGlynn said. "That's where you want to be, and that's where we are now. We will prepare well now over the next two weeks for the final." Gallagher was a big part of Donegal's glory years, having been Jim McGuinness's number two for three years. For another three years, Gallagher was Donegal's manager. Gallagher, it is said, knows Donegal inside out, but McGlynn has a different slant. He said: "I suppose it depends on what way you look at it, we as players have a brave insight into Rory's mind, but it's all on the day. "We were very grateful to have Rory over the past couple of years, and he played a big part in some of the players' success. "But at the same time, there are a lot of new players in our team that probably haven't played in an Ulster final, so it's going to be a huge day for them and a huge day for everyone involved. "I'm sure both Fermanagh and Donegal will look forward to it." McGlynn's return to action was managed carefully in 2018 and on Sunday, it was a different sort of feeling when the Glenfin man was replaced with 12 minutes to go. Donegal were coasting in the Ulster semi-final against Down when McGlynn made way for Mark McHugh. A thunderous roar greeted McGlynn's departure; almost a defiant nod by the Donegal faithful to last summer. When he flung the Donegal kitbag over the shoulder as he left his home at the foot of Alt na Paste, in the heart of An Gaeltacht Lár, for another go, it was for times like this. 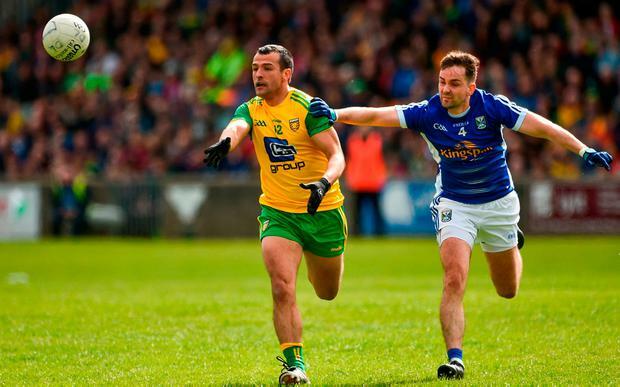 Even minus the red-carded Neil McGee, Donegal had 13 points to spare against Down in a one-sided semi-final as they reached a seventh Ulster final in eight years. McGlynn said: "We were blessed that the forwards were on song again, and we put up a big score. "We knew if we put up a big score, the defence will hold out our end of it, and that's what we did. "We knew going out at half-time that if we pushed on again at the start of the second half that we would put the game to bed and we did." McGlynn, 32, made his debut for Donegal in 2006, when a lot of his current team-mates were still in primary school. Bonner has tweaked his role now, but his impact and importance remain as strong as ever to Donegal. Donegal have racked up an impressive 6-58 across their championship wins over Cavan, Derry and Down so far in 2018, but McGlynn has been around long enough not to take anything for granted. His cautious tone bares the signs of a man who has been around the mill in Ulster too often. He said: "We were probably putting Monaghan up there in the top two or three teams in Ireland, so any team that gets the better of them are there on merit. "Fermanagh are a team that we are going to prepare for like any other team, and hopefully we will have the preparations done come two weeks time."